Peek-a-boo, I see you! The long known game toddlers love to play and parents love to watch the reactions of their little ones. Every one of my kids LOVED to play some form of peek-a-boo when they were toddlers. We are still having fun with our youngest who finds it the best ever when mom or dad hides behind a toy, blanket, around a corner or just our own hands and reappear like magic! When I saw the Playskool Sesame Street My Peek-a-boo Elmo, I knew it would be something my youngest would absolutely adore. She loves peek-a-boo like I said and she also loves Elmo. The best of both worlds! Playing Peek-a-boo is so much fun with everyone's favourite, friendly red monster. Recommended for little ones ages 18 months to 4 years old, Playskool Sesame Street My Peek-a-Boo Elmo helps little ones learn about cause and effect. It also helps with social play skills and promotes imaginative expression. 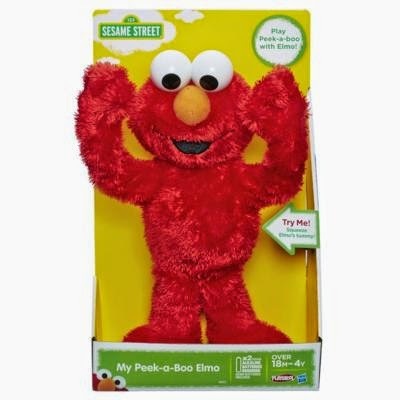 It's easy for little ones to play peek-a-boo with Elmo by squeezing his tummy. Elmo will put his hands in front of his face and say fun phrases in his famous Elmo voice. He says 15 phrases in all. When his tummy is released, his arms lower for more peek-a-boo fun. I have always enjoyed watching my kids play with Elmo toys. They have had a bunch of different Elmo toys over the years but this is one of the best so far for children under the age of two. Elmo is soft and bright, his voice catches little ones attention every time. Its simple enough for a toddler to operate and simple enough for them to understand. With the holiday season fast approaching, I think this new Elmo would make a great addition to any toddlers Sesame Street characters collection! You can find Playskool Sesame Street My Peek-a-boo Elmo at local toy stores like Walmart, Toys R Us, Target and online at Amazon for around $20. For more information about this and other Playskool Sesame Street toys, please visit the Hasbro Canada website! Posted on behalf of Hasbro Canada. Complimentary product provided. Opinions and comments on this blog are honest and those of the author.